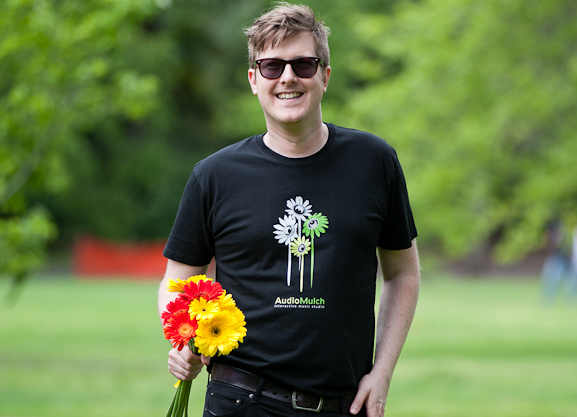 By popular demand we've produced a limited run of exclusive, high quality, AudioMulch T-shirts. They're available now! 5 color design by Lisa Engelhardt. 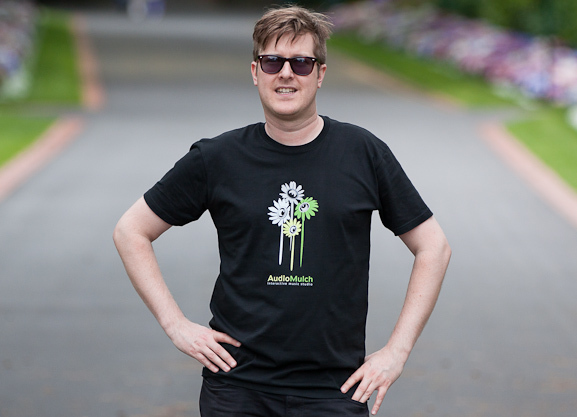 High quality organic cotton t-shirts by AS Color, screen printed by Super Special. Body width (inches) 18.1" 19.7" 21.3" 22.8" 24.8"
Body length (inches) 28" 29.1" 30.3" 31.1" 32.1"
Body width (inches) 15.9" 16.9" 17.9" 18.9" 20.4"
Body length (inches) 26.6" 27" 27.4" 27.8" 28.1"
Please check your measurements – these are Australian sizes and may differ from what you might be used to in other parts of the world. The guys shirts are AS Color model 5005 (Black), the girls are AS Color model 4005 (Black). Sizes marked n/a are unavailable – either sold-out or we didn't print that size. Sorry about that, it's hard to predict demand for each size. Please let us know if your size isn't available and we'll make sure we print more of your size next time. Follow us on twitter for news about reprints. 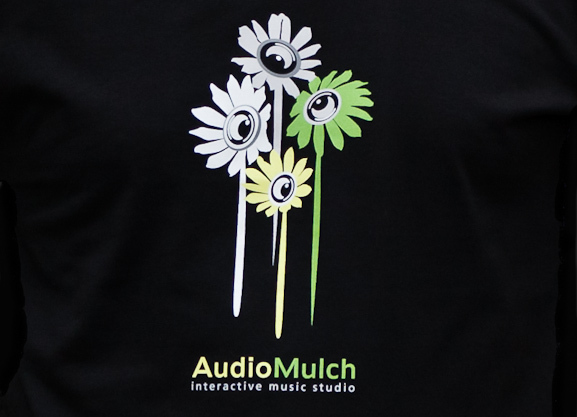 AudioMulch T-shirt sales and shipping are being handled by our friends at Noise-X-Change. To buy, click one of the PayPal buttons below, buy direct by emailing orders [at] noisexchange.com, or visit the Noise-X-Change eBay store. Noise-X-Change is an Australian eBay power seller. See below for more details. Find your region, select your size and click the PayPal buy button to buy. Prices are in AUD and include shipping. To order more than one shirt to the same shipping address please contact Noise-X-Change for combined shipping prices. Noise-X-Change also accept direct payments by bank transfer, credit card, or cash payment with direct pick-up from their Melbourne CBD location. Email orders [at] noisexchange.com for details. Within Australia: Sent by Express Post. We ship the same business day if you place an order before 2PM Melbourne time. Express Post guarantees next business day delivery within the Express Post Network. Outside Australia: Sent by Air Mail. Orders usually arrive within 7-14 days but please allow up to 28 days for delivery. For enquiries about ordering please email orders [at] noisexchange.com. If you have any general questions please feel free to send us an email or post to the forum thread.